In a major shift, the United States is set to produce more oil and liquids than Russia and Saudi Arabia combined by 2025. 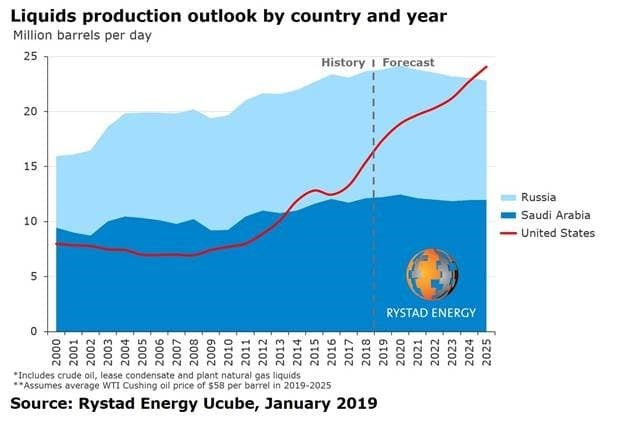 In Rystad Energy’s base case oil price scenario, US liquids production is forecast to surpass 24 million barrels per day over the next six years, thereby outpacing the combined output from Russia and Saudi Arabia. “The United States, having regained its position as the world’s top liquids producer in 2014, is poised to accelerate into a league of its own over the next six years and eclipse the collective output of its two closest rivals by 2025,” said Rystad Energy partner Artem Abramov. Historically, the US, Russia and Saudi Arabia have consistently switched places at the top of the global list of liquid producers – measuring crude oil, lease condensate and plant natural gas liquids – but lately market-driven US oil activity and production has built significant momentum. The US has not seen its liquids market share exceed 50% among the “Big Three” producing nations since 1970. 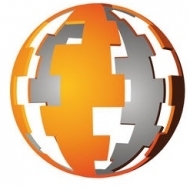 Rystad Energy, the independent energy research and consulting firm headquartered in Norway with offices across the globe, assumes an average WTI Cushing oil price of $58 per barrel in 2019 to 2025. The growth in US liquids production will be driven by major shale basins such as the Permian in parts of Texas and New Mexico. Given the steep production decline rates of shale wells, consistently strong annual capital expenditure (capex) levels are needed in order to deliver on our base production forecast. This corresponds to as much as 20% growth compared to the investment level observed in the US oilpatch in 2018, while the $260 billion capex level recorded in 2014 is not expected to ever be seen again. Good luck with that at $55.00 per bbl. And at $58.00 per bbl the next 6 yrs, I would beat on the current rig count or declining rig count. This article is identical in content and prediction to the one posted by Tsvetana Paraskova of oilprice.com on December 22, 2018 under the title: ”IEA Chief: US Oil Output to Near Saudi+Russian Production by 2025”. In her article, Tsvetana Paraskova quoted Fatih Birol, the Executive Director of the International Energy Agency (IEA) as saying that “total US oil production around 2025 will almost equal the combined production of Russia and Saudi Arabia”. Rystad Energy went a step further than Fatih Birol by stating that the United States is set to produce more oil and liquids than Russia and Saudi Arabia combined by 2025. Rystad Energy is taking its hype about US oil potential to an unprecedented level thus exceeding that of Fadil Birol for which he was rebuked by Saudi oil minister Khalid al-Falih in Davos in 2017. Both Rystad Energy and the IEA are utterly wrong in claiming that US oil output will be close to the combined output of Saudi Arabia and Russia by 2025. Such a claim is not only ridiculous as it can’t be substantiated in geological and economic terms but it also verges on a blatant attempt to curry favour with the Americans. Is it a coincidence then that Rystad Energy’s announcement comes at a time when reports about a slowdown in US shale oil production are coming thick and fast from different reliable and professional sources. Never a day passes nowadays without new reports coming about a slowdown in US oil production. These reports from the Wall Street Journal (WSJ), International oil service companies such as Schlumberger, Baker Hughes and Haliburton and other authoritative organizations including MIT, the Institute for Energy Economics and Financial Analysis (IEEFA) and Sightline Institute are all talking about declining well productivity, slowing drilling activity, plunging US rig count, a huge backlog of drilled but uncompleted wells (DUCs), rising drilling costs and also rising breakeven prices and therefore can’t be ignored. The most recent report for the world’s largest oilfield services company ‘Schlumberger’ says that the slowdown in shale drilling activity is creating uncertain outlook for US shale oil output in 2019. And yet, the US Energy Information Administration (EIA) is projecting a production of 12.1 million barrels a day (mbd) in 2019 which has now been reduced to 12 mbd from 10.9 mbd in 2018 and 12.8 mbd in 2020. The IEA, the Financial Times, BP Statistical Review of World Energy and Rystad Energy are all in cahoots with the EIA in their hype of the potential of US shale oil. Yet, the writing is on the wall for the US shale oil industry. Its demise is neigh probably within the next 5-10 years. That are absolutely great news, nobody in the future is going to blackmail the Western World again. Not even Kilifah, with the fat boy on the top. Politiscs is a lot about the oil and the oil is a lot about the politics, so realy nobody cares seriously to whom will Venezuela belong to at the end. But having that aim acheved, ME is definitely loosing its upper heand in practicaly everything.Israel will manage without fat boy (MBS). Western values will be preserved, leverage of terorism will crumble and India and China will feel safer as well. Great news. Fat boy and his followes can continue to have their wet dreams about greatnes of nothing. Make America great again.